Johannes Gutenberg University Mainz (JGU) is expanding the range of its international research collaboration projects. 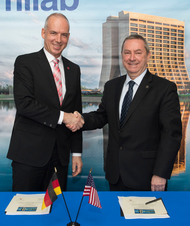 During a visit to the world-famous Fermi National Accelerator Laboratory (Fermilab), the USA's national research laboratory for particle and high-energy physics, JGU President Professor Georg Krausch and the Director of Fermilab, Professor Nigel Lockyer, signed an agreement on closer collaboration. "Our research in the fields of particle and hadron physics at Johannes Gutenberg University Mainz is held in high regard throughout the world. The establishment of our PRISMA Cluster of Excellence underlines this. 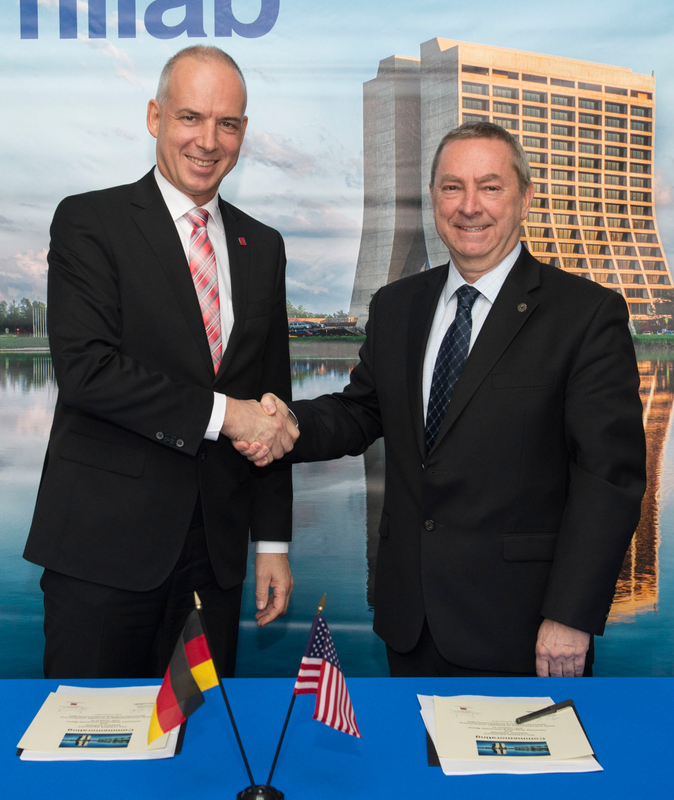 With Fermilab we are now acquiring one of the world’s leading high-energy physics institutions as our partner," emphasized Krausch. Together with Professor Matthias Neubert, one of the directors of the PRISMA Cluster of Excellence at Mainz University, Krausch was involved in discussions in Chicago last week with the aim to further substantiate and specify the collaboration between Mainz University and Fermilab. "The Fermi National Accelerator Laboratory is the world’s leading institution in the field of accelerator-based neutrino physics, which will also play an important role in our work at PRISMA," added Neubert. This collaboration will strengthen JGU's position in the upcoming German Excellence Strategy competition, in which it will have to assert itself against other German research universities. The JGU Cluster of Excellence "Precision Physics, Fundamental Interactions and Structure of Matter", or PRISMA for short, studies fundamental aspects of the nature of the elementary building blocks of matter and their relevance to the physics of the universe. "PRISMA brings together leading research groups whose international scientific prestige has already long been substantiated by numerous publications, awards, and excellent placings in national and international rankings," stressed Krausch. Thus, the current Funding Atlas of the German Research Foundation lists the Institutes of Physics and Mathematics at Mainz University among those that attract most third-party funding. Fermilab is America's premier national laboratory for particle physics and accelerator research. A U.S. Department of Energy Office of Science laboratory, Fermilab is located near Chicago, Illinois, and operated under contract by the Fermi Research Alliance LLC. It was given its current name in 1974 in honor of the Nobel Prize winning physicist Enrico Fermi.